I do this, but with matte photo paper. I didn’t get great results with magazine paper (or I didn’t have the right magazines). Anyways, I spent the money and bought Epson matte photo paper and it’s been working great. I decased my laminator to allow for larger and smaller boards. Smaller boards wouldn’t come out, and larger boards wouldn’t fit it. You do have to run them through a good 8-10 times though. And they come out pretty hot. i use a laminator as well and i, too, could not get magazine paper to work. i use glossy paper (the kind *without* water protection, that is very important as you have to remove the paper by soaking it) which works great. i run my boards through about 15-20 times as i found that boards wouldn’t etch completely if i did it less. at any rate, using a laminator is much much better than a clothes iron, i can’t stress that enough. i used to have problems etching boards with dip ic’s with a clothes iron, now with the laminator i do surface mount soldering with tssop ic packages just fine. oh and i also tried canon matte photo paper, and it didnt work for me either. To those who have done this: What brand/model laminator is good for this sort of thing? in other news: wtf is happening with the piratebay? 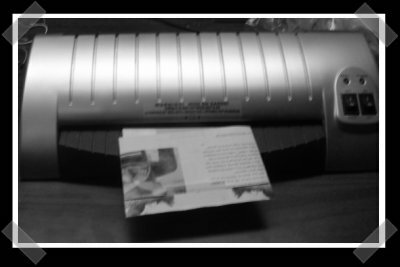 the one you see in the picture is the laminator from walmart. I bought it months ago to test it never got to make it work it the special PCB paper. I never tried it with photo paper or magasine. I think the printer makes a big job too. Be sure that the printer puts a lot of toner on it! I have tried different setting with no luck. Iâve had it over a year and it works great. It has adjustable temperature but I have always used the highest setting. Also the rollers are spring loaded, not sure how unique this is but it probably helps since pcbs are thicker than what the machine was designed for. Also be sure and use 1/16â pcbs, when I started using this method I took me awhile to figure out that the thinner pcbs I was using was the reason my board were not coming out rightâ¦ wasnât getting enough pressure. brian: i have a royal sovereign rpa-5254 found on ebay for $60 usd new. where did that come from? i haven’t even posted since yesterday. And miked, that was probably a preemptive strike. Which appears to have worked well. Not to take anything away from the featured site, but hasn’t Don Lancaster been doing this for at least a decade? Search tinaja.com for “kroy color”. Part of the problem may be that even though I’ve been reading Don since Radio-Electronics days, I don’t think he has exactly gone into a lot of detail of what a “kroy color machine” is. If you are using Eagle Cad – look at doing “Ground pouring”. Basically you use all possible space for ground, there giving you a lot faster etch time and, well, a better ground plane. Very helpful in Audio/RF IIRC. > where did that come from? i haven’t even posted since yesterday.